I have had the honour to meet H.E. President Bashar Al-Assad at his home in Damascus and to have a one and half hour talk with him. It has indeed been the most gratifying human talk with the distinguished Arab Leader. H.E. President Assad was in person receiving me at the entrance of his house smiling with pride, self-confidence and elegance. It has indeed been a cordial social meeting in a magical setting in a white salon, wall, white chairs and white marble overlooking from a wooden Damascene window a green garden, and with a refreshing drink of flowers conducive to the setting whiteness. "Assad is Protector of Christians in Middle East." I am from the UK and I wanted to get a message to your president. Please stay strong, one day the slaves will wake up and see how all of us are the creation of a corrupt society and will remove these corrupt people once and for all. Until then people like me will watch in horror at what is happening in your country and hope that Russia and Syria win this awful war going on in your country. There is nothing I can say or do that will stop this, but I just wanted the president to know that there are people like me who know the truth. So please never give up, ever and stop this greed from taking over your lands. in questo momento difficile per il tuo paese , va il mio personale sostegno affinchè la vittoria ti sia favorevole. La forza della giustizia e della perseveranza sia conte. Gloria e sostegno al popolo siriano che sta lottando contro le interferenze straniere imperialiste che vorrebbero fare della Siria una loro colonia di sudditi . in this difficult time for your country, my personal support goes so that the victory is favorable to you. The force of justice and perseverance is count. Glory and support to the Syrian people who are fighting against the foreign imperialist interferences that would make Syria their colony of subjects." I want to tell you, that no matter what our government would say, we are many civilian people in Norway that don't believe the media when they say Assad is behind the attack against civilian. But media don't let him come out and defend himself against these accusations. I hope Assad will talk through youtube or twitter etc. as soon as possible, so we can spread that on internet. Let the truth come out. BLESS SYRIA, PRESIDENT ASSAD AND THE SYRIAN PEOPLE. The people are on your side. she “likes” the Syrian strongman, and that he’s been very helpful and protective of Christians in the country." Sister Carolin Tahhan Fachakh of the Salesian Daughters of Mary Help of Christians, who runs a nursery school in Damascus, Syria, told reporters . Thana Issa, a prominent English Teacher, March 2018. "H.E. President Bashar Al-Assad has led the Syrian people under critical international and internal circumstances and managed to preserve the dignity of the country." 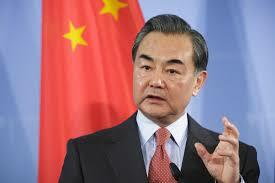 Chinese Foreign Minister, MR. Wang Yi , November 24, 2017. 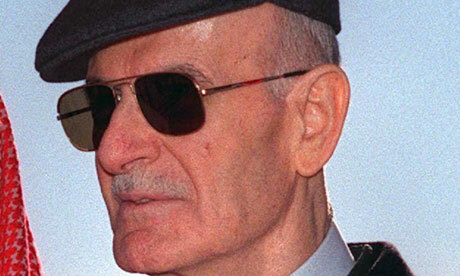 “President Al Assad has led Syria with the humble heart of a servant of his people. 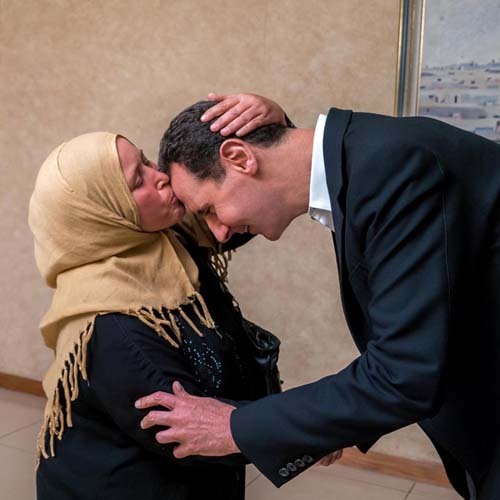 He is strategically brilliant, courageous, steadfast, and utterly devoted to the people of Syria." "The First Lady, Asma Assad, works tirelessly, tending to refugees and visiting families whose sons died in battle." "President Al Assad is protecting the Christians not just in Syria but elsewhere in the Middle East too, and he does not consider Christians just as a “minority” but rather an important and integral part of the Syrian society." His Holiness Archbishop Hanna Atallah Hanna, the Archbishop of Sebastia from the Greek Orthodox Patriarchate of Jerusalem, August 14, 2017. "During the past few years Christians have suffered a lot but thanks to President Al Assad there is hope now as was also seen in Ma`aloula where wounds are slowly healing." "The restoration of the Christian Churches, destroyed by terrorism in Syria, is ongoing under the personal care, follow up by President Bashar Al-Assad. I salute His Excellency and do appreciate his steadfastness, courage and ability to withstand the ongoing crisis in Syria." "President Assad is characterized with openness, clarity and transparency where he has the same words in his closed-door meetings and in public and to media means." "His Excellency underscored to me during his meeting the pivotal role of Christians in the Orient and that the disappearance of Christianity from the Orient means but distortion for our region as well as for our history." "President Assad is one of the most peaceful, loving, and kind leaders the Middle East has known in recent times." "Mrs. Asma Al-Assad, the First Lady of Syria has a fundamental humanitarian and welfare righteous role in alleviating the suffering of Syrians." On September 17th, 2017, President stressed, in a meeting with participants in the Syriac Youth General Gathering -Syria 2017 in the presence of Patriarch of Antioch and All the East for Syriac Orthodox Mor Ignatius Aphrem II and a number of patriarchs and archbishops, that the strength of eastern Christians stems from their living in full integration with other religions in the region in general and in Syria in particular. "Christians in Syria are not guests or migrant birds; rather they are the basis of the homeland's existence, because without them the diverse Syria we know has no existence and, at the same time, Christians without Syria have no land or existence" reiterated President Assad. I am an Italian working now in Qatar and I wish to express all my compliment to you, to your brave soldiers and to your wonderful family because, from the web sited I read, it seems that the Syrian population is taking back is Country. I really hope that all is true, I wish to express my gratitude to you and my deeply apologizing as a western, as Italian, I really hope that one day you will forgive countries like Italy that did not support you and keep a passive attitude during the days when Syria was attacked by the criminals that our press described as "fighters for the freedom". I hope one day I will have the chance to come and see your wonderful Country but more than this I really wish Syria will get back Golan from the criminal Zionist that are the cancer of the humanity. "H.E. 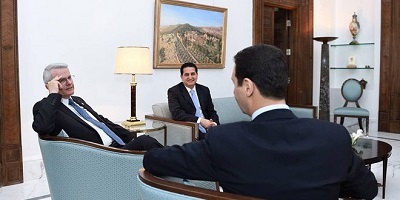 President Bashar Al-Assad is highly educated with matchless politeness and capacity to analyze and evaluate stances. President Assad leaves his place inside his office and stands in waiting and warmly welcomes his guests, be they officials, journalists or citizens. President Assad's welcome words leave no barriers as to make any guest more convinced with the justice of his stances on the criminal war launched against Syria by the forces of darkness, backed by US, Zionist and European sides. Victory is definitely for President Assad, God Willing, and defeat is for his enemies." Mohammed Elfawal, Egyptian renowned journalist, August, 2017. "The way this man-H.E. President Bashar Al-Assad- held his country together in spite of all the outside efforts to destroy it by turning it into a redux of Iraq and Libya is amazing." Adrian Médecins Sans Frontières, August 2017. "H.E. 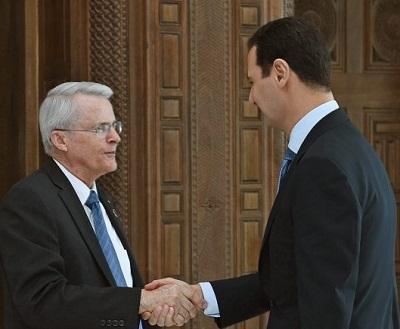 President Bashar Al-Assad is steadfast and steady and he establishes crystal clear alliances over as under the table. To H.E. President Assad the hat should be lifted." "Great Young Hafiz Al Assad God bless him and protect him from All Evil. Hope his Parents will enjoy him at All times." "It took a tremendous amount of courage from the Valuable and Esteemed President Bashar Al-Assad, to resist the Anglo-American Barbaric Murderers, who have used the most vile, perfidious , monstrous and cunning ways to overthrow him. They have been flooding the world with war crimes, wherever their Cowardice could assassinate State Leaders and their entire populations without fearing any kind of Retaliation, as they only attack defenseless Nations, much weaker than they are in military power, and therefore unable to respond. Never have they fought a loyal fight where powers in presence were equivalent. Remember Irak, Remember Libya, Remember North Korea. Remember Yemen. Always the coward way, always far from their own well preserved homeland, always massacring entire populations, hospitals, children, innocent victims of their appalling State Terrorism. They have done that in Syria. But President Bashar Al Assad is a man of Honor and Duty. He is a Patriot who loves very dearly his people and will defend them until his dying breath. How many Statesmen would have endured so much for the love of their people ? Many other Presidents have flown away from their country to live happily in some golden exile, precisely by lack of love towards their people." Hello, we are group of young Bosnian Serbs and we are big supporters of Syria and Syrian Arab Army. We send big support and love for Syrian president Bashar Al Assad and for Syrian people. Know that all Serbs in the Bosnia and Serbia are supporters of Syrian people, because we know what you are going through. Back in 90’s Serbs were in the same position as Syrians are now, we were demonized and accused for starting the war against our own people, but the truth was that were victims of the same US, Saudi Arabia global hegemony and their proxy armies. We also fought the same terrorists from Al Qaida and Muslim brotherhood, so we know what SAA is going through, and we wish them to stay strong. 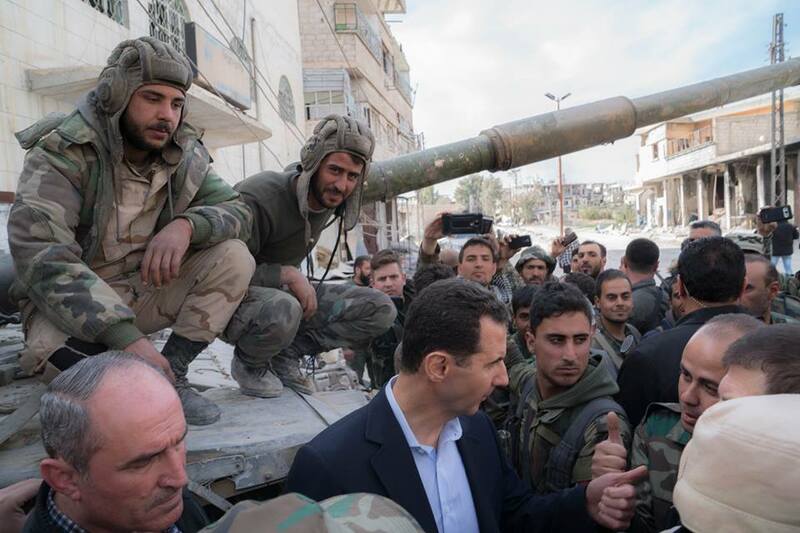 Syrian people, Syrian Arab Army and their president will be remembered in history as a heroes and winners and Serbs will always respect what you have done for all mankind. We wish all the best for your people. Viva Syria!!! My name is Adhara Mendía, I'm a 23 year old Mexican female. I've been following the situation of your beautiful country which has been stuck in my heart for a while. I would like to congratulate you for the labor you're doing to defend your nation. I know it's been tough for you and for your people. I'm contacting you because I would like to do some volunteer job in your country, as I'm taking a 6 month break from college to recharge some energies. I'm an interior design student and I would love to use my knowledge to help the people whom lost their homes. I don't know if I as Mexican would have any problem to join your country. Please let me know if this could be possible, and I'd like to apologize if in any moment I was being rude, my English is not 100% perfect. 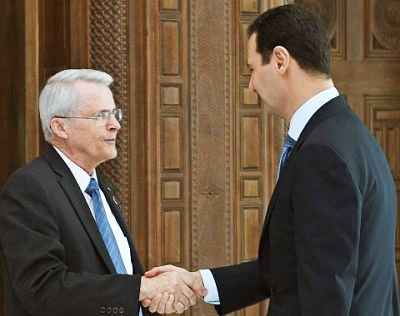 I wish to express my support for President Bashar Al Assad. The USA (a police state) is 100% Zionist compromised and controlled. That is fact. AIPAC pulls the puppet strings of Donald Trump and the international bankers guarantee it. There are many Americans that know the truth behind the CIA /Mossad false flag operations going as back to the King David Hotel and the Levon affair in Egypt. Since I work in London making films, TV shows and documentaries -- I would very much like to interview President Assad and present the independent truth for social media and YouTube. "I am not sure if I have the correct email, however I just want to pass on my regards to the president. I wish him success in your war on terror, and would like him to know that people in the west do read between the propaganda, and can wish him, and Syria well"
"President Bashar Al-Assad's war against terrorism is ours because we believe that these terror organizations are a common enemy so we must support President Al-Assad, the brave statesman working for building a diversity-rich Syria." Filip Dewinter, Member of Belgium Federal Parliament Member. "President Bashar Al-Assad is the enemy of ISIS. President Bashar Al-Assad was proved to be the only one who managed to resist extremism, the danger from which the French people are currently suffering. The enemies of our enemies are our friends and President Bashar Al-Assad is the enemy of Daesh terror group." “I believe the most genuine people in their efforts to fight terrorism right now are the Iraqi Prime Minister Haider al-Abadi and the Syrian President Bashar Assad." U.S. Congresswoman Tulsi Gabbard, March 17, 2017. "I am from Vancouver, Canada and I supports Bashar Al-Assad in fighting against the Terrorists in Syria. The USA is part of the problem in Syria and has been condemned throughout the world. Russia and Hezbollah are doing good work in helping the Gov't of Syria fight the Terrorists. Most people in Canada support Bashar Al-Assad although the Canadian Gov't don't. I think with the Help of Russia and Hezbollah Syria will win this fight against the Terrorists." "I am an American who believes President Bashar al-Assad is a very good man and leader of Syria. I do not believe that he has used Sarin gas or other chemical weapons on anyone. The propaganda of the Network TV Media in the United States, on many issues, but in particular those against Assad, are exactly just that -- bogus spurious lies -that is, propaganda, controlled by persons inside the U.S.A. and also among foreign Elites who have a not-so-hidden agenda. I see President Assad, first as a Medical Doctor who has clearly sacrificed his life of relative wealth, living in London, for a difficult & extremely dangerous challenge for himself and his wife & children - to save his nation from its enemies -- foreign & domestic. I do not credit either the U.S. Media or our government under Bush, Obama and now Trump on its condemnation of President Assad. As far as I am concerned, he is innocent of the heinous crimes for which he has been falsely accused. I hold him in high respect, and hope that he has a guardian angel to protect him and his family... I also respect President Vladimir Putin of Russia for helping to protect Mr. Assad." "Mr. president, congratulations on being so far ahead of all other world leaders. I have seen all of your English interviews and most of your Arabic interviews. and everything you have predicted has happened. you have so many followers around the world that believe in you. and all other world leaders are jealous of you. God bless you Mr. president. and I will be looking forward to seeing your next English interview. God save the president and Syria." "This is the man that the US propaganda machine has convinced many citizens in the West, that is a threat to his people. 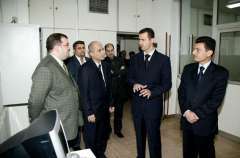 There is not one Political leader in the West that would be able to freely walk amongst their citizenry as Assad does. Do not fall for the lies and deceptions of our media and politicians." "Western propaganda can spin as many lies as it likes, but these images speak for themselves. NO ONE has the right to dictate what is best for Syria except Syrians themselves. May Assad and TRUE Syrians prevail over the evil that has been unleashed upon that country. 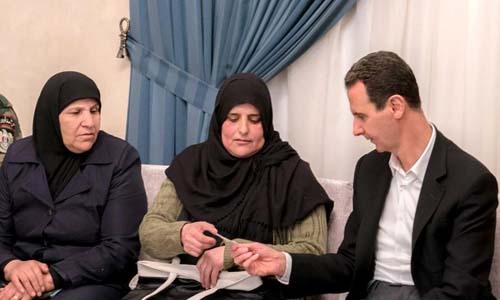 Assad and his beautiful, intelligent and truly wonderful wife." 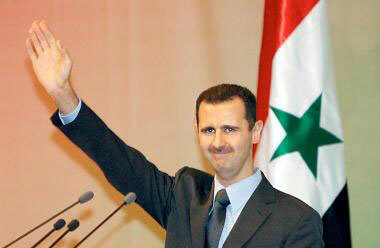 Just want to wish Syrian President Bashar Al-Assad A happy birthday. May God bless and protect him and his family. since I have never been to Syria, I cannot really judge your policy, but you are the elected president of your people, and nobody should be allowed to bomb any of your military bases without checking whether you really broke any international law. If Syria is to get rid of you, then it should happen in a national election, and in no other way. I do not believe that you attacked your own people with chemical weapons, I think the USA did this to bring you into miscredit with the international community. I hope that we can make people see the truth before it is too late. Please keep on telling this to the US, who are wrecking other nations for their own benefit, causing millions of your people, Iraqui people, Serbs, ... fleeing to my home-country and depending on the help of my people, who sometimes do not have secure jobs themselves. I for myself have been unemployed for about eight years despite my doctoral degree. My country is going downhill and we cannot help others for much longer. We need to look after ourselves. We have to make the USA see that they cannot continue with their egoism any longer. I have shed tears aplenty since the past six years on the condition of your country and what the so called "international community" which in reality is merely a band of 3-4 nations bullying the world has done to your great country. Sir, as I write this message, the respect in my heart for you grows in huge multitudes. I wish I could fight for you, and for the sovereignty of your country. I don't know how I can but I certainly have the aspiration to do it. May Allah grant you victory soon. Hello President Bashir Al Assad, this note is just to say I support you and encourage you and your government and your people and your country in your 'fight the good fight', you'd be surprised at how many people around the world are slowly waking up to the wrong perpetrated against you and your country, a huge following on all social media outlets! I'm sorry Australia has chosen to 'follow big brother' and is implicated in atrocities against you 'not in my name' I can assure you, if only there were a political party in Australia I could vote for that was against involvement in 'the crusade against the Arab world' I'd vote for them in a second (there's an election coming up in my state of WA very soon but alas I still have not found such a party to have any confidence in). Thank you very much for your quick and informative response. 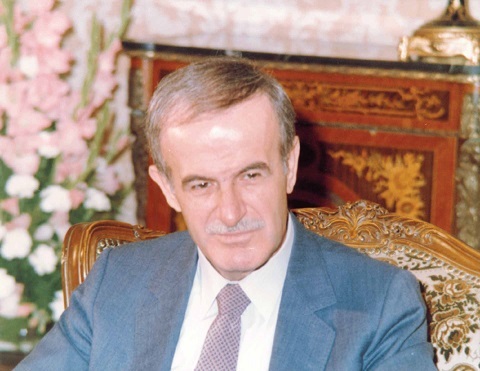 Your efforts on producing the English translations of Hafez al-Assad’s speeches and interviews have been very insightful to my research. President Assad, It has come to my attention lately that the media in the "west" is completely controlled by, let us say, the Illumined ones". It seems they are "nation building" in your country, as they have all over the world and not telling us. I pray for the restoration and peace of your people. The Middle East was relatively peaceful and tolerant of the West and its' customs until they started destroying Iraq. Then came Egypt, Libia, parts of Africa, and now your country. We in the states united experienced a similar event called the Civil War. Really the whole thing was orchestrated by "money interests". I am a follower of Yeshua and I pray His grace and mercy on you and your people. I feel i have to e-mail you my support with your fight in you country against the evil terrorists and the US led coalition who are arming these rebels. The west interference in your country is shameful. With your Russian friends i know you will win against these evil people. Good luck with your battle against terrorists and extremists in Syria. You are doing great work which western governments lack the courage to undertake. If these terrorists are allowed to win in Syria then the rest of the civilized world will be under threat from them. I wish that western governments would come to their senses and recognise that you are the only person who can end the war and bring order to Syria. Mr D Haylett, United Kingdom. Our exchange of ideas, thoughts and aspirations started about the unjust causes behind the ongoing for years bids as to launch campaigns of slander and smearing ! I recalled what H.E. President Assad said on March 29, 2015, CBS interview, "As long as I have the public support of the Syrian people. That's my legitimacy; legitimacy comes from the inside, but why? I will tell you why. Because the West used to have puppets. Not independent leaders, or officials in any other country. … the West, and especially the United States, don't accept partners. They only accept followers. Even Europe is not partner of the United States. That's to be very frank with you. So, this is their problem with Syria. They need somebody to keep saying yes. Yes-- a puppet. Marionette. And so on." Is there a president, king, leader worldwide more clean, honest and popular than the president of Syria? NO, we both agreed according to present and documented facts. "…but we’ll never be puppets who work against our interests for their interests," reiterated President Assad in his BBC News interview, February 10th, 2015. "I care a lot about being independent president for independent Syria. And do my best, according to my convictions. That's the most important thing," as declared to ABC's Barbara Walters, December 7, 2011. You guess Kris! If President Assad-like were to be a presidential candidate in many countries where rulers call for his down in Syria, President Assad-like is surely to be elected, said Mohammad, given the large support shown by world civilians worldwide. Yes, many French voters wrote President Assad's name in their ongoing Presidential elections! "It was President Assad’s interview with RT in 2012 that started to wake me up about Syria in the first place. Until I watched that, I could not have picked out a picture of him or perhaps not even been able to confidently locate Syria on a map. I was an all-too-typical American, full of opinions about the Middle East but empty of knowledge, understanding or in many ways I’m ashamed to say, empathy. While acting as Commander in Chief during one of the most complex and brutal conflicts in history, against an array of enemies including the US, UK, France, Israel, Saudi Arabia, Qatar, Turkey and of course the Muslim Brotherhood, President Assad has also had to fight an unprecedented information war against the most well-coordinated and sophisticated media propaganda blitzes ever seen. This dark, false narrative has supported the terrorists on the ground and the diplomatic terrorism that’s been employed against Syria by every major western country and their allies as well as the UN. That is all in addition to running a country in wartime and in the most conflicted region in the world. Yet I have watched him rise to each challenge. He and the First Lady are exemplary in my opinion and personal heroes of mine now. Have mistakes been made? I would be shocked if there weren’t; he is human after all and these are extraordinary times. However, the foundation he was and is trying to build of quality secular education, health care, sciences and technology, opening and growing of the economy and tourism, respect and protection for women , all religious and people groups, is positive and productive. I particularly appreciate the Assads’ devotion and commitment to the younger generation. They know that that is where real change begins to defeat extremism. I am heartbroken when I consider what the past several years would be have looked like had the west and allies not intervened to try to crush the prosperity and stability that was growing. Syria Times and the President Assad unofficial site I use again and again. Syria Times is a broad spectrum resource that is kept up to date and relevant both for the daily changing situation on the ground as well as general information about Syria. The President Assad page is a welcomed archive of news and information related to the president with invaluable articles, photos and background to help activists like me combat the constant slandering of that great leader." US Peace Activist, Janice Kortkamp, January 17, 017.